Q: Guruji, I am having a good family life, a good career, good interpersonal relationships, and I am very satisfied and know God is within me, do I still need to do meditation? Sri Sri Ravi Shankar: See, meditation is something that maintains what you have. You have everything going good for you; do you want to maintain it? Do you want to maintain good health, good relationships? Then you have to do meditation. Meditation reduces stress otherwise tension builds up and after five to ten years, you will burst out. Meditation helps you to be sane and helps you to maintain what you already have. That is why it is called Yogakshemam; Yoga is to attain what you dont have, and kshemam is to protect what you already have. If you already have and you want to maintain it, then also meditation is essential. If you dont have something, to get it also you need to do meditation. Q: Guruji, When did you realize that you are meant to be Guruji? 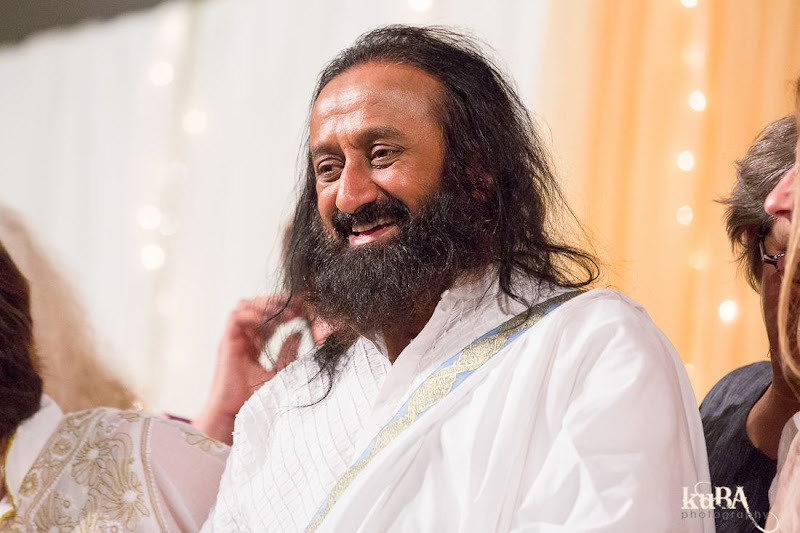 Sri Sri Ravi Shankar: See, one who goes around saying, I am a Guru, does not become a Guru. The Guru tatva manifests in one who does not proclaim to be a Guru. One who remains simple and natural is a Sadguru. And a little bit of this Guru tatva is present in every one of you as well. You also now and then give some good advice to someone or the other, and you also spread love and joy to those around you, isnt it?! We must love and serve others without wanting anything in return. This is important. Usually, we think, I gave so much love to that person, what he gave me in return. In this way, we try to make the other person feel that we have done them a great favor by loving them, this we must not do. Love is your nature, love does not mean that you keep saying, Oh I love you so much, no! It is acting with dignity, naturalness, compassion and simplicity, and we are born with these qualities. If sometimes you need be firm then be firm. You can get angry only when there is love. Nevertheless, surrender all your qualities and become hollow and empty. To come closer to the Guru tatva, this is what you need to do ñ surrender all your positive and negative qualities and be happy. Q: Guruji, you say that everything is changing. So if there is stability in our life, should that also change? Sri Sri Ravi Shankar: Through all the changes you will realise that there is something inside you that does not change at all. The purpose of change is for you to recognize that which does not change. Q: Guruji, if you have to tell us one secret for success in this world, what would that one secret be? Sri Sri Ravi Shankar: When you strongly desire something, simply believe it is going to happen. Simply know that the giver is so compassionate, and you will get what you desire if it is best for you. This faith, ‘The giver is going to grant me what is the best for me’, does the job! Q: Guruji, There are crores of Hindus all over the world. However, Hindu Gods and Goddesses are being humiliated. Is God angry with us? Sri Sri Ravi Shankar: No, God is not angry. Some people are doing these things. Dont worry about it. No one can insult the Hindu religion. Whoever is doing this is just showing his ignorance. Even if someone is behaving offensively in the media or cinema towards Hinduism, it should not make us sad. Hinduism has been there for hundreds of thousands of years and it will continue to be there. So if anyone says anything against Hinduism, just take it as their ignorance and foolishness. If we get angry and retaliate in an improper way, burn buses, throw stones or try to harm those who speak against Hinduism, that will not increase the respect of Hinduism in society. The respect towards Hinduism will improve with our behavior, our softness, our service and by educating others. Q: Guruji, what is the significance of silence in our life and how can we maintain silence in our daily routine? Sri Sri Ravi Shankar: There is no need to maintain silence in our daily routine, but there is also no need to speak too much! If you maintain some silence, you will think before you speak. If you keep talking, you yourself will not understand what you are saying.